NEWARK, N.J. — Despite being eliminated from post-season contention, the banged-up New Jersey Devils have hurt the playoff hopes of some wild-card contenders in recent weeks. "We got the point, but we have some guys playing tight," said Arizona coach Rich Tocchet, whose team is on an 0-2-2 run. "It's my job to get these guys to relax." "He's such a beast," Coleman said of Blackwood. "He is intimidating. You come down on him and he takes up a ton of net and he can move as fast as anybody I have seen. I am surprised they got any on him." 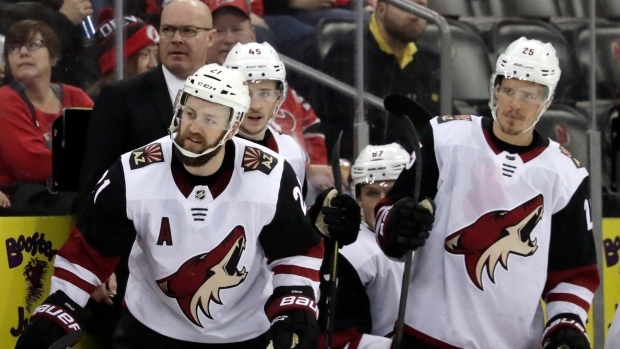 Blackwood gave up an early goal to Arizona defenceman Oliver Ekman-Larsson, while Kuemper gave up a soft one to Drew Stafford late in the first period. "It was a bit open and so was mine," Zacha said. "My mind was made up when I was going and the guy was really far from the net." "We battled hard and that's all you could ask for a team," Coyotes defenceman Niklas Hjalmarsson said. "We're playing in the NHL against good teams. They had a lot of guys back in their lineup and they have a good hockey team. There are no easy games." Both teams had players returning from injury. The Coyotes' Stepan missed 10 games with a lower-body injury. Back for New Jersey were Hischier, Kyle Palmieri, Miles Wood, John Queeneville and defenceman Sami Vatanen and Mirco Mueller.